Why St James Laser Vision? The Leeds Teaching Hospital NHS Trust has invested very heavily to ensure that the eye surgery department continues to deliver the very best surgical outcomes. Having access to the most accurate and reliable lasers available allows us to carry out all our procedures to the highest levels of precision and our clinical data justifies our pride in delivering some of the very best results in the UK. In 2012, our ophthalmic surgeons, Andrew Morrell and James Ball, carried out extensive research on the latest generation of refractive lasers and were unanimous in recommending the VisuMax to the NHS Trust for procurement. We are delighted that this has been approved, making St James Laser Vision the only clinic outside London to utilise this state-of-the-art technology, along with the best Excimer Surface Laser Technology available, to continue to offer the very best results for our eye surgery patients. The main criteria for assessing refractive surgery technology is the accuracy of the beam guidance and the quality of balance between the repetition rate and the laser pulse energy. The better the technology, the more accurate and therefore gentler the treatment. The Visumax technology allows the surgery team to deliver outstanding accuracy, not only to precisely remedy a range of eye conditions, but also to leave the tissue outside the defined treatment area untouched. These outstanding levels of precision and accuracy allow the surgery team here at Leeds to treat patients with thin corneas or high ametropia, who may have been considered unsuitable by other clinics. Our ability to treat patients who have been turned down by other clinics derives from the quality of our technology, not a willingness to take commercially-driven risks. 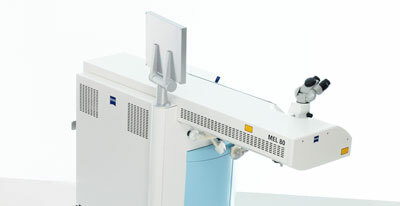 The MEL 80 Excimer Laser from Carl Zeiss Meditec is designed to make all the stages in the refractive surgery process safer, more patient-friendly and individual. High ablation rate for smoother results. High performance eye tracker system - an active 1kHz eye tracker with excellent feedback times and ultrapid IR camera provide exact positioning during the laser treatment. Designed for fast treatment to minimize dehydration of the eye during surgery. Patients only need to concentrate on the fixation light for a few seconds. Cone of Controlled Atmosphere (CCA+) system ensures consistent atmospheric conditions during treatment. The MEL 80 is designed to fully support the surgery team during all steps in the refractive surgery process including preoperative examinations, individual treatment planning, precise flap creation, highly effective refractive corrections and follow up examinations. At St James Laser Vision, we've put a lot of time and effort into procuring systems that are configured to talk to each other so that the treatment plan data produced during the examination and diagnostic phase of the refractive surgery process is immediately transferred to the MEL 80 excimer laser and the Visumax femtosecond laser. This streamlines and controls the entire process, fully supporting individual treatment plans and delivering the very highest levels of patient care.